Bolivia's new Socialist President, Evo Morales has lost no time in visiting sympathetic foreign leaders. His first stop naturally was Cuba. From the US Communist Publication "Workers World". "The New Year began with a development of the greatest importance for Latin America and for the class struggle: a visit by Evo Morales to revolutionary Cuba. It was the first trip abroad by the newly elected president of Bolivia. He went on New Year’s Eve, just as Cubans were preparing to celebrate the anniversary of their socialist revolution. Morales is also expected to visit South Africa, China and Brazil. He is not planning to visit the United States. Evo, as he is affectionately called by his supporters, will be inaugurated on Jan. 22. 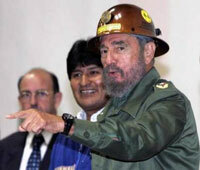 The Cuban government placed a lot of importance on Morales’s trip. A high-level delegation of Cubans took part in the meetings with the Bolivian president-elect. They included the president of Cuba’s National Assembly, Ricardo Alarcon; Carlos Lage, vice president of the Council of State; and Foreign Minister Felipe Pérez Roque. On the Bolivian side were 60 representatives, the largest delegation to accompany Morales abroad. Presidents Castro and Morales immediately signed bilateral cooperation and solidarity agreements during the visit. The agreements, signed on Dec. 30, mainly cover health care, education and sports. As a result of these agreements, Bolivians will now be receiving free eye care, with Cuba contributing equipment and specialists. Cuba is also offering 5,000 scholarships for Bolivians to become future doctors and specialists. Cuba will assist in a national literacy campaign in Bolivia as well. Evo Morales’s orientation to Cuba shows that the popular movements in Latin America are gaining strength and are veering away from Washington. They are anti-imperialist and for self-determination. Like Hugo Chávez in Venezuela, Cuba now has a good friend in Evo Morales of Bolivia—a friend whose priority is the people’s needs, not imperialist greed. This trip showed the unbreakable links between the peoples of Latin America and Cuba. Bolivia is the land where revolutionary leader Che Guevara, who was born in Argentina but fought in the Cuban Revolution, was killed by the CIA. Despite all the attention on the "war on terrorism", the U.S. drug war in South America and its heavy emphasis on coca crop eradication has largely gone unnoticed by the American public. However the "Plan Dignidad" (dignity plan), which seeks to reduce coca production to zero, is seen by many Bolivians as an attack on their livelihoods and way of life. Morales has taken the right path by promising that his government will not only try to interdict drugs, but also to preserve the legal market for coca leaves. His promise to allow more coca farming and to promote the legal use of coca products should be supported by the United States government. The "Plan Dignidad" has been a failure since its inception and the money could be better spent on other projects.